How do you coordinate a multi-section information literacy lesson while ensuring all students have a quality experience? With LibGuides, of course! 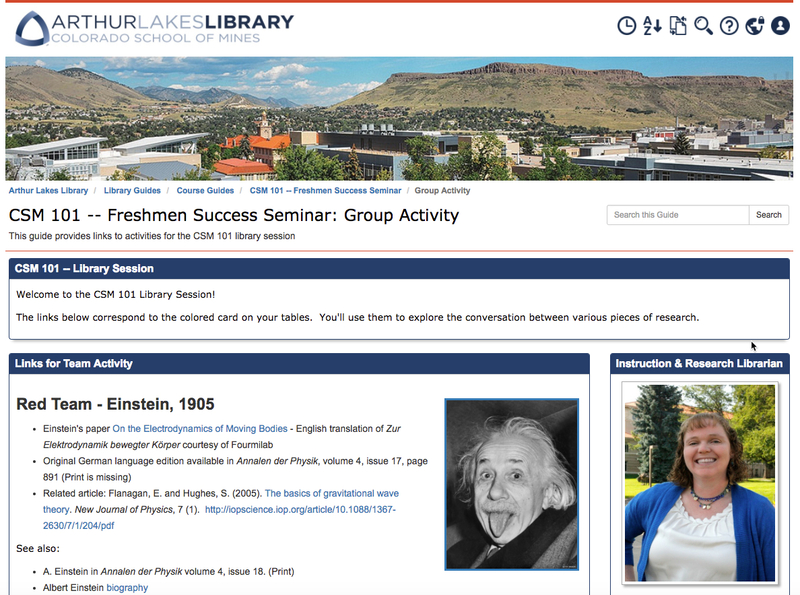 In fall 2017, Arthur Lakes Library used a LibGuide for the “Scholarship as Conversation” lesson in the Mines’ Freshman Success Seminar course. Roughly 1200 students, 92 peer mentors and 46 instructors rotated through a 50 minute lesson and library tour over the course of 10 days. The CSM 101 LibGuide kept multiple instruction librarians on track, hosting both a Google slides presentation and links for the class activity. During the lesson, student were introduced to the Mines LibGuides collection and used the course guide to trace the conversation that developed as modern researchers build on the work of STEM giants such as Rosalind Franklin and Albert Einstein. This talk will describe the lessons learned and provide attendees with tips for using LibGuides to successfully implement large-scale information literacy lessons on the platform.